Thrown (Volume) Charges vs. Weighed Charges — What is Better? When we first ran this story a year ago, it spurred a hot debate, with strong opinions on both sides of the issue. 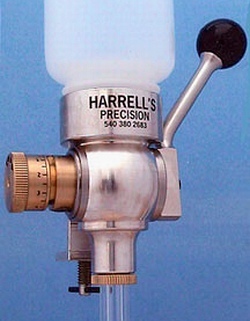 Some guys argued vehemently that volumetric powder dispensing was best — citing the experience of short-range benchresters, most of whom still throw their charges. Others say weighing your charges is best, so long as you have a very precise, and very repeatable scale. We know some of the top 1000-yard shooters weigh their charges to the kernel. For long-range applications, most people believe that precise weighing of powder charges is the best way to achieve optimal accuracy and low ES/SD. 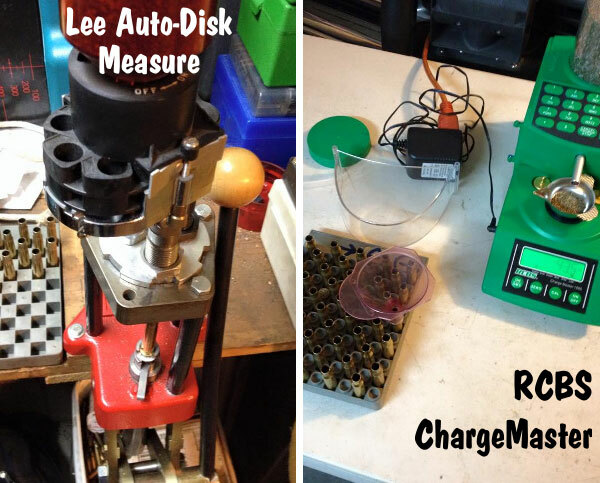 Our testers have definitely seen ES/SD go down when we started weighing charges with a lab-grade force restoration scale. However, those short-range Benchrest guys still do pretty darn well with their thrown charges, at least at 100 and 200 yards. Share the post "Thrown (Volume) Charges vs. Weighed Charges — What is Better?" Bullets as art? 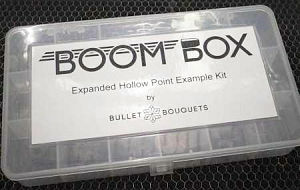 Here’s an interesting product — a collection of fully-expanded hollowpoint bullets. If you’re shopping for self-defense ammo, take a gander at these projectiles in “full bloom”. The $69.95 Boom Box includes five (5) popular hollow-point bullet types in three different calibers: 9mm, .40 S&W, and .45 ACP. That’s a total of fifteen bullets. Bullet types are: Barnes TAC-XPD, Federal HST, Hornady XTP, Sig Sauer V-Crown, and Speer Gold Dot. All 15 bullets have been live fired, cleaned, clear-coated, and labeled. Does the .45 ACP really more stopping power than 9mm? Which manufacturer makes the best self defense bullet? What bullet design expands most reliably? These are common questions among gun owners. 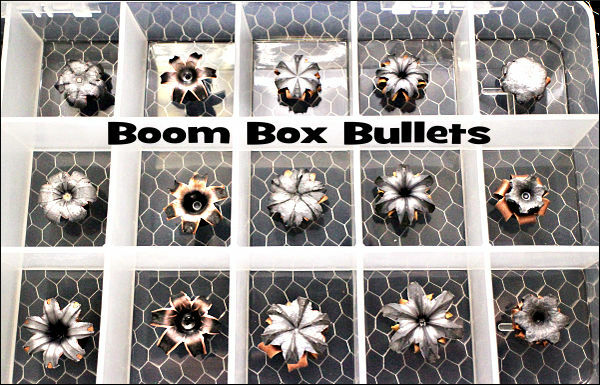 The Boom Box bullet samples can help answer your questions about expansion, terminal ballistics, and lethality. Plus, let’s face it — these fired, fully expanded bullets just look cool. Anthony Zambai, mechanical engineer and owner of BulletsBouquets.com, started the business shooting Federal HSTs into a tall bucket of water, then turning the expanded bullets into desktop ornaments, jewelry and magnets. After a year of improving on processes and techniques, Bullet Bouquets gets consistent expansions that closely mimic established terminal ballistic test results. They shoot each round, one by one, and recover them. After some cleanup, they spray a durable clear coat on the exposed lead to keep it from oxidizing and discoloring, as well as helping to keep the lead off of fingers. 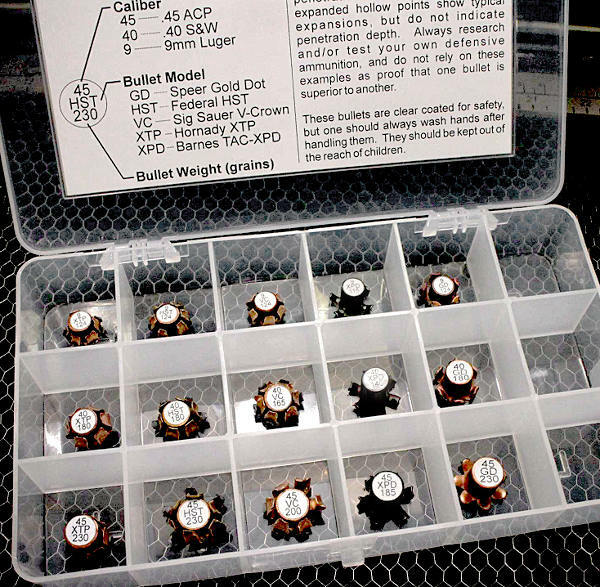 Finally, the expanded bullets are each labeled with caliber, brand, and bullet weight, then placed in the display box. Share the post "Boom Box Collection of Fired Hollowpoint Projectiles"
Browning is running an excellent Winter Savings promotion this month. You can save up to $100.00 on select Browning shotguns, rifles and pistols. This rebate offers applies to the consumer retail purchase of any new Browning firearm (A5, Maxus and BPS shotguns, AB3 rifles, Buckmark and 1911-22 pistols) purchased between February 1, 2016 and March 31, 2016. CLICK HERE for printable Browning Winter Savings Rebate Application Form (PDF). Offer valid only on the consumer retail purchase of any new Browning firearm (A5, Maxus and BPS shotguns, AB3 rifles, Buckmark and 1911-22 pistols) purchased between February 1, 2016 and March 31, 2016. This offer is valid for end-users only. Limited to one Winter Savings firearm rebate submission per firearm/serial number. All documents must be postmarked no later than midnight April 15, 2016. Allow 6-8 weeks for processing and delivery of rebate. Offer void where prohibited, taxed, or restricted by law. Offer valid in the United States only. All purchasers must be citizens or legal residents of the United States. Must be 21 years of age to qualify for pistol rebate. 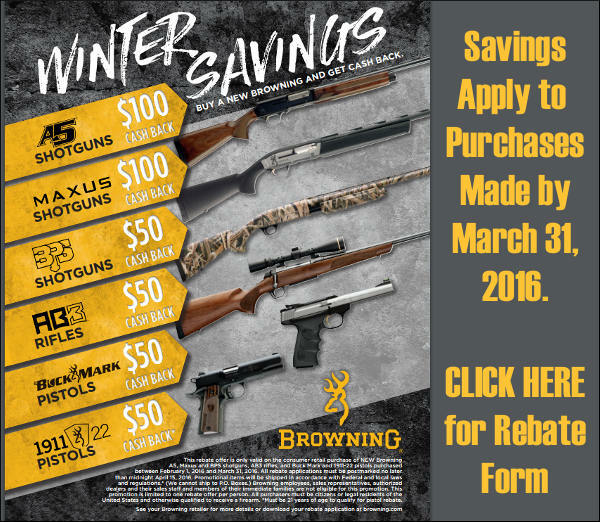 Share the post "Browning Rebates Available Through the End of March, 2016"